Scientists have shown for the first time that insects, like mammals, use vision rather than touch to find footholds. They made the discovery thanks to high-speed video cameras – technology the BBC uses to capture its stunning wildlife footage – that they used to film desert locusts stepping along the rungs of a miniature ladder. The study sheds new light on insects' ability to perform complex tasks, such as visually-guided limb control, usually associated with mammals. According to lead author Dr Jeremy Niven of the University of Cambridge: "This is another example of insects performing a behaviour we previously thought was restricted to relatively big-brained animals with sophisticated motor control such as humans, monkeys or octopuses." Because insects such as bees and flies spend a lot of time flying, most research has concentrated on how insects use vision during flight. Many insects that spend a lot of time walking, such as stick insects, crickets and cockroaches have relatively small eyes and use long antennae to 'feel' their way through the environment. Locusts spend time both walking and flying, and have short antennae and large eyes, which made Niven wonder whether they used vision to find footholds. To answer this question, the team built a miniature locust-sized ladder and filmed the locusts walking along it. They counted the number of times the locusts missed steps, comparing the number of mistakes they made in different situations. "By combining all these different experiments, we showed that locusts use vision to place their legs. We showed that when locusts can't see one front leg they stop using that leg to reach to the next ladder rung, favouring the leg they can see," Niven explains. "Big-brained mammals have more neurons in their visual systems than a locust has in its entire nervous system, so our results show that small brains can perform complex tasks. Insects show us how different animals have evolved totally different strategies for doing similar tasks," he says. As well as illustrating how insects can achieve similar results to mammals by using simpler mechanisms, the findings deepen our understanding of locusts' neural circuits. This is important because locusts have been a model organism for studying limb control for the past 40 years. 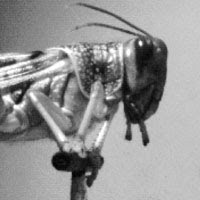 Insects such as the locust have been crucial to many breakthroughs in neuroscience, and insects are often the inspiration for limb control in robotics.